Top New Zealand boatbuilder, Rayglass Boats, has emulated its sailing, rowing and rugby counterparts and out-performed its trans-Tasman rivals, winning the coveted Club Marine Australasian Platinum Dealer of the Year award. It is the first time the award, for exemplary customer service and outstanding support, has been won by a Kiwi company. “This is a great honour for Rayglass and New Zealand,” says the Rayglass CEO Dave Larsen, “especially given the comparative size of the boating industry in Australia. 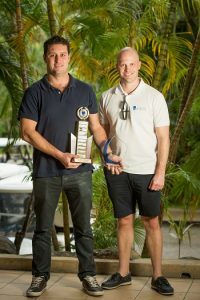 Rayglass Boats CEO, Dave Larsen (left), receives his Club Marine Australasian Platinum Dealer of the Year award from Club Marine CEO, Simon McLean. Club Marine CEO Simon McLean says Rayglass Boats winning the award is recognition of the Kiwi company’s superior customer service and sales capability and testament to its strong partnership with Club Marine. Based on the water’s edge in the Auckland suburb of Mt Wellington, Rayglass manufactures and sells the multi-award-winning range of luxurious 6-12 metre powerboats, ruggedly stylish Protector RIBs support and patrol boats and the highly innovative Pro-Jet (the world’s first commercially-manufactured PWC-powered RIB). Employing over 60 people in three state-of-the-art manufacturing facilities, Rayglass Boats is one of New Zealand’s most successful marine businesses, both at home and internationally. They are New Zealand’s largest GRP boat manufacturer and export their world-renown Protector RIBs to 27 very diverse countries around the globe. Club Marine’s Platinum Dealer Program recognises a select group of dealers as leaders within the marine industry, with Platinum Dealership the highest level of recognition a dealer can receive from Club Marine. The award is just the latest in a long line of accolades for the successful Kiwi boat builder. In June, Rayglass was awarded the BDO Exporter of the Year (export revenue $1million – $10million) category at the prestigious Air New Zealand Cargo ExportNZ Awards and, last October, they won the Excellence in Exporting Award at the Auckland Chamber of Commerce’s Westpac Business Awards. Rayglass Boats has also won numerous Boat of the Show and Overall Boat of the Show awards at the Hutchwilco New Zealand Boat Show, New Zealand’s largest boat show.